The Locke Nest Chalet is a custom timber framed home built in 2010 in a secluded neighborhood just 2 miles from Sunday River skiing and golf, with easy access to Bethel village. This warm, energy-efficient home Sleeps 10 and has all hardwood and stone tile floors with radiant heat. The fieldstone propane fireplace in the living area provides a cozy spot to gather after a day outdoors. The great room features a 23' cathedral ceiling and loft in an open concept. In the loft you'll find a 40' LCD TV with Blu-ray player. Nestled in the woods in a beautiful, private setting at the end of a cul-de-sac, you can cross-country ski and snowshoe right from the door in the Winter, and hike and mountain bike in the warmer seasons. There is also direct access to snowmobile trails behind the Sunday River ski area. In the Summer, golf, hiking, fishing, and biking are minutes away. The Chalet is available for short-term or seasonal rental. Make the Locke Nest Chalet your vacation home and base camp in the Sunday River/Bethel area! The downstairs bathroom has a beautiful custom tile shower with glass walls. Upstairs and downstairs bathrooms feature stone vessel sinks and slate tile floors. Invisible, quiet radiant heated floors throughout the house add to your comfort in the cooler seasons. Beautiful field stone propane fireplace for heat and ambiance. Comfortable leather sofa and love seat by the fireplace. A quiet Bosch dishwasher. You won't know it's running. A roomy french door bottom-freezer, stainless refrigerator. 12 cup Cuisinart drip coffee maker with a gold filter. Granite countertops, eat-in island, soapstone apron front sink, and all the cooking equipment you need to make it a pleasure to stay at home are provided. The cabinets have stone knobs locally made. The dining table is a beautiful live-edge birds-eye and curly maple table. Television is connected to the internet but not to cable or satellite TV. Netflix is available and you can bring your own box for other internet access or gaming. 2 decks, best enjoyed in the warmer seasons. We loved our ski vacation at George and Julie's beautiful home near Sunday River Ski Resort. The home has everything could possibly need and is extremely well kept. George and Julie provided all the necessary information we needed prior to our trip and were quick to respond to any question we had before and during our trip. The home is perfectly located, short distance to the money and close to many great restaurants. We would definitely stay again. A must see. If I could I would love to buy it. George was very pleasant. Immaculate!!!!! This was a beautiful home, well maintained with everything you need for a nice vacation. It's in a quiet neighborhood surrounded by woods. We stayed in the summertime. It's about a hour away from Mount Washington, near easy river rafting and some nice hiking areas. Simply gorgeous house!! Excellent location. We stayed here for a long ski weekend. The house and all of it's features are gorgeous. The kitchen is very well provisioned, which made cooking in lots of fun. The bathrooms are beautiful. And the living space is open, yet super cozy, really comfortable layout. It was nice for each couple to have their own bathroom. And George and Julie are fantastic hosts, very helpful and great communicators. We stayed at Locke Nest Chalet during the February school vacation and absolutely loved it. The house is amazing, well-appointed, cozy and impeccably clean. We did not want to leave it and even ate in in the evening. The owners were great -- attentive, responsive -- and take wonderful care of this house. We cannot wait to visit it again. First of all, I would like to apologize to George for a very, very late review. Anyway, I will be the first to admit, the place was too big for just the two of us, but this was a problem that I enjoyed, we treated the chalet as a home base for some summer adventures to Mt. Washington, Sunday River Golf Course, zip lining on the mountain, and we fished every-single-day!... fly rods, on the Sunday River and the Andro!! 2 minutes from the chalet is Sun Valley Sports. fly shop/canoe and kayak rentals... Many thanks to the owner Lisa who made our week a blast! Summer is great around Sunday River!! If I could give it 7 Stars I would!! Thanks for the very nice review and for being such good guests. It was our pleasure to answer questions about the property. It's great that you were interested! The Bethel/Sunday River area is indeed an excellent Summer and Fall destination and not well enough known for it. Maybe you can manage another getaway this Summer! 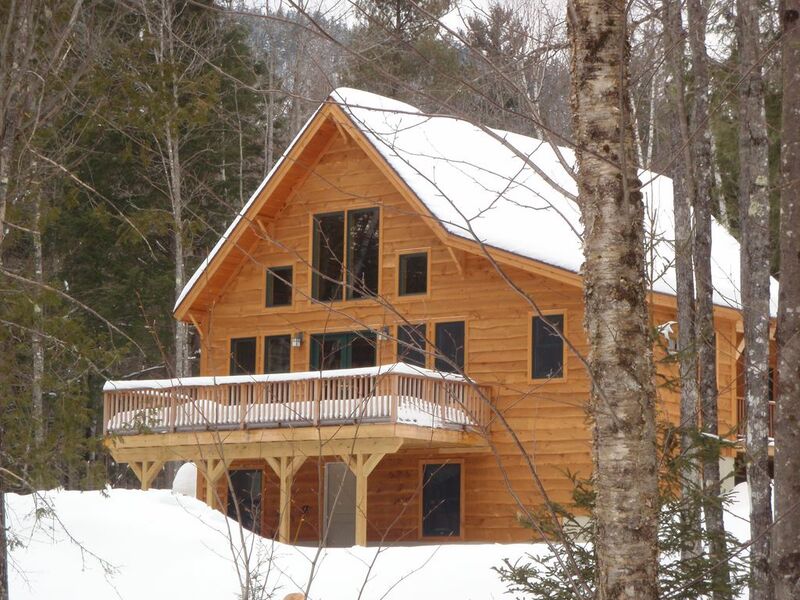 Located in the Mountains of Western Maine near the Sunday River Resort, the Locke Nest Chalet is in the perfect base for your family getaway any time of the year. In the Winter you can travel 2 short miles to the South Ridge base lodge or you can snowmobile, cross-country ski, or snow shoe right from the front door. In the Summer you are 3 miles from the Sunday River Golf club or enjoy the many mountain activities minutes away -- fishing, biking, zip-lining, hiking, canoeing, kayaking, rafting. You can always simply enjoy the privacy of our location and sit on the deck or the farmer's porch. Discounted rates are available for couples looking for a getaway! Contact the owner. Rates for holidays may be higher and provided upon request. Holidays include Christmas/New Years week, MLK weekend, and school vacation week in February.